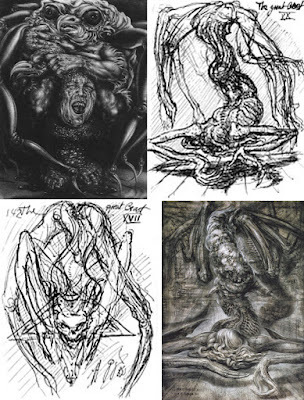 So it was that Giger composition borrow from Sybille Ruppert's charcoal piece "The Last Ride" created back in 1976, with its long dangling limbs and sack like head at the centre of the picture. 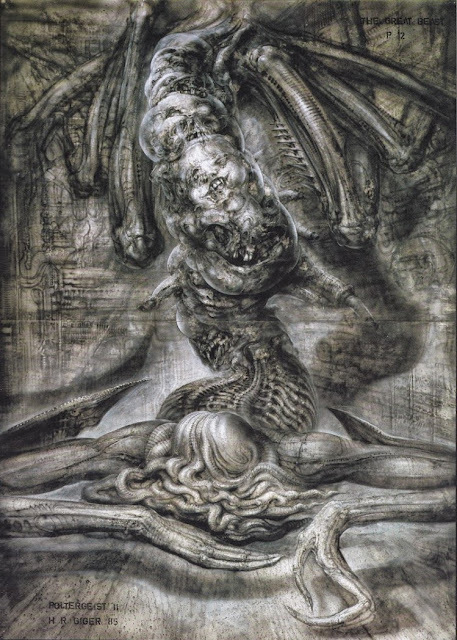 However describing what is what in Giger's art is slightly difficult because the person reading this is going to look at both pictures and spend time wondering what is supposed to be what in them anyway. In Ruppert's work, the eyes of the beaked spider creature had turned into the hip joints of the The Great Beast and the beak transformed into a suggestion of one of the head sacks that make up a totem pole like column in Giger's work. 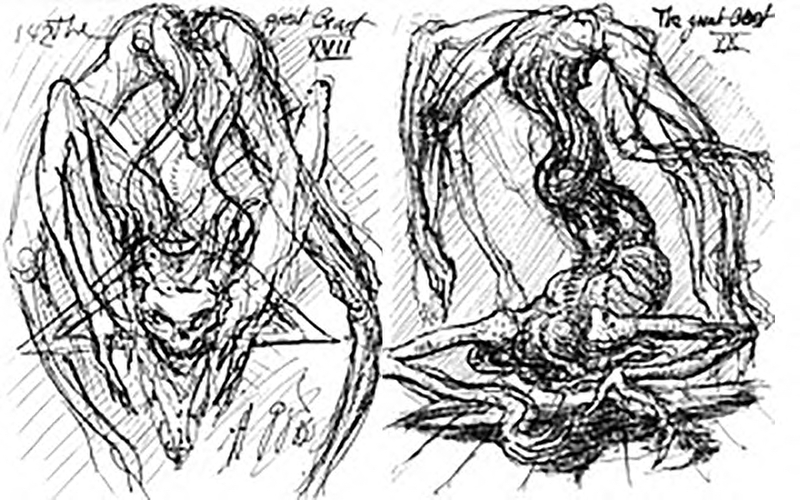 The eyelids also inspire the shape of the buttocks in the sketch of the great beast merged with the pentacle. The highlights of the legs either side of the stool in Ruppert's painting become legs stumps in Giger's work. The claws at the end of the spider creature's legs became transformed into the fingers of the hands given to Giger's great beast. 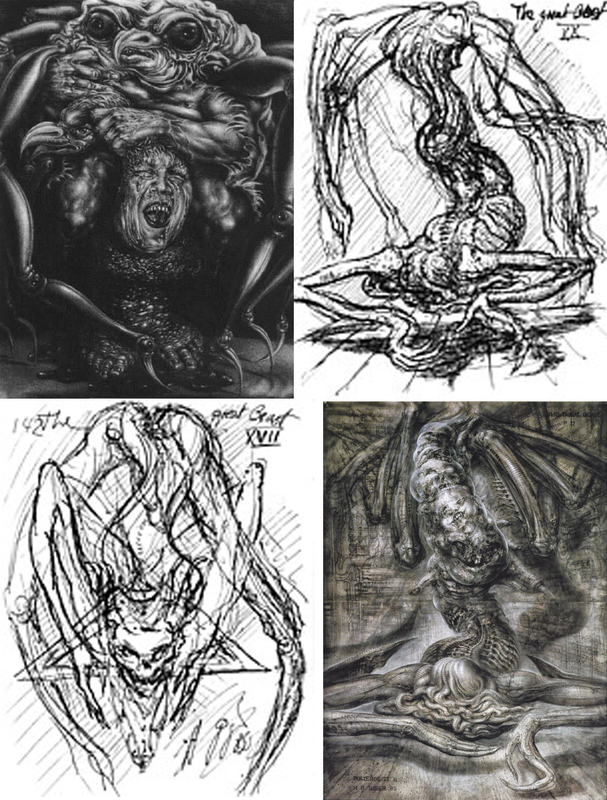 In some of the drawings, Giger's creature's legs dangle just like Ruppert's painting while not in Giger's painting itself as the legs left unfinished are bent at the knees with the lower legs raised in the air. 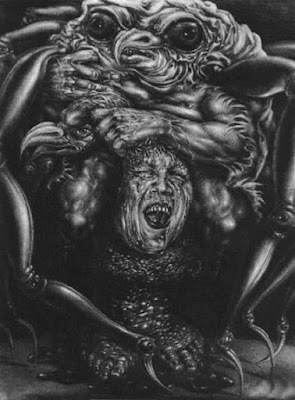 The stool with feet at the bottom of Ruppert's painting have been transformed into the ribcage, the head with the unseen face and tentacles of Giger's gorgon like beast. 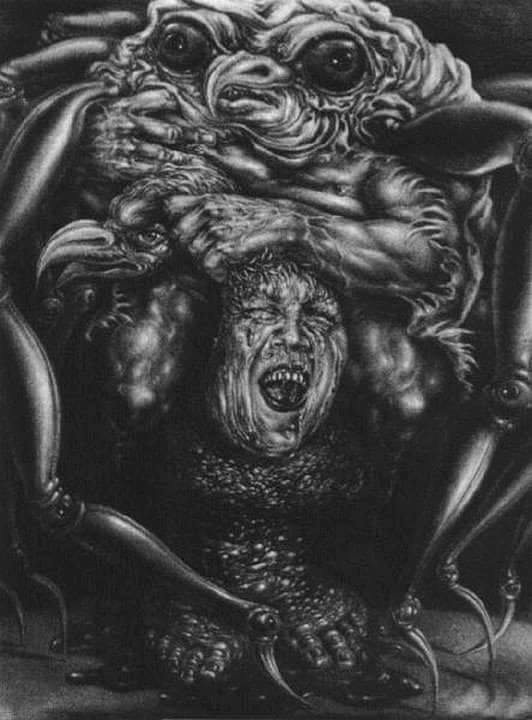 The seat of the stool has been incorporated into the lower jaw of the bottom deformed sack like face in Giger's beast and so the black space between the bottom face in Rupperts picture and the seat have transformed into the mouth of the deformed faced in Giger's painting.